Our first start in Isan: Khao Yai National Parc (2011)"
Recently, wide bike paths are being built separately from the main roads. The risk here in the area Hua-Hin, to be involved with another road user in an accident, is a lot less than in Europe. Most of the time, the cars and trucks pass in a 1-2metric distance. Her honking is more of a friend's mark than a common one in Europe "hello, watch out, I come!" Most accidents that happen to us are due to non-mastery of the own road bike. Jan. 2011: It started with the "Hua Hin Bicyclists"
In December 2010, the Australian Paul Hamon, the Englishman David McReynolds and the Swiss Max Lehmann met in the famous fish restaurant Chaolay in Hua Hin to start a mountain-bike club. 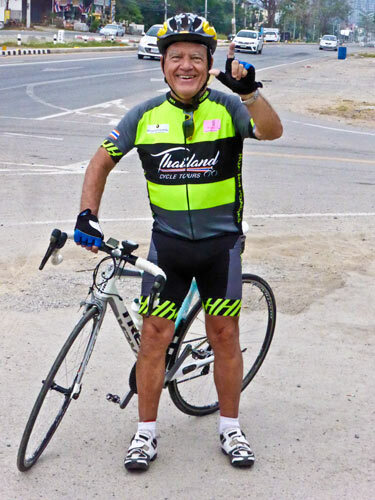 The "Hua Hin Bicyclists" were born. Since Paul was a web programmer and also understood a lot from Facebook, in the first days of 2011 he set up a homepage and a Facebook account, both of which are still available in 2017 today. The first 3 members soon became a group of 10 active mountain bikers. Cross-country rides were the main activity. We also participated in several 2-day events at the Bangkok Hash Harriers and drove several hundred kilometers by car to the north or the Isaan to Khao Yai National Park. The writer learned off-road driving from Australia's Barry Edwards. He drove with me criss-cross, and also down the steepest paths. At first I had to get off the bike, later I had the courage and technique to stay on. I learned how to master the bike with the Mountain-Bike. The „Hua Hin Roadies“ group continued to grow. Trips with 10 and more well-equipped bikers were not uncommon. The exits were published on Facebook. Each member planning an ride, created an "Event" indicating the start time and meeting point, as well as route selection. So everyone knew the date and could sign in. This procedure is still valid today. During the European winter season there are almost daily exits with distances between 70 and 120 km. Since 2014 we also have our own racing dress. We are proud of it because we are recognizable on the street and look awesome. We do not run a warehouse, but we order new ones every year if there are enough people to sign up for a minimum of 20 pieces. Over time, younger and especially stronger drivers joined the group. Most of them never enjoyed a driver „education“ in a club. They are typical single riders with a lot of power in their legs. Their driving style was more type of a race with irregular speeds. Their average speed was well over 30 km/h. It was inevitable that the 65-year-old and older riders could not keep up with the 50-year-old and younger ones. Often some got stuck behind drafting or the group broke away, or had to fight beyond their capability. As a consequence we created a second group in Facebook: the "Hua Hin Gentlemen Roadies". This should not separate the old from the young Roadies, but only highlighting the events in this group with "moderate speed" and smoother rides. 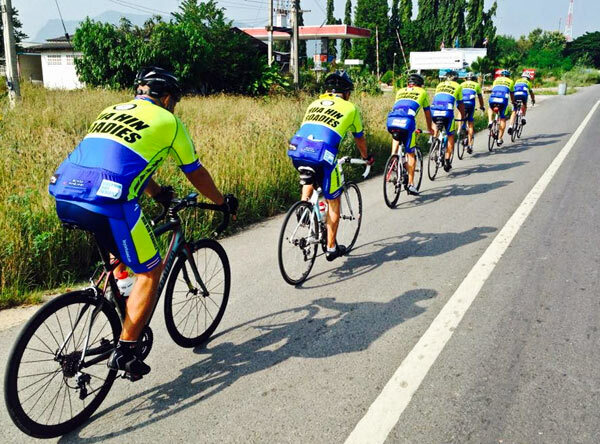 You would like to ride your road bike around Hua Hin? You are not quite fit and maybe have a lack of training? Your are a little older and unable to keep up the speed of the younger ones? Fun, Happiness and Teamwork is your priority? You can maintain an average speed of 25-28km/h and like distances of 60-95km? Several times we enjoyed to welcome famous or less famous Pro-riders. Lucien Kirch of Luxembourg is an active member of the Roadies. Raced in his Junior years in the same Team as the Schleck Brothers. In 2016 we welcomed Ernesto Guidali, Pro rider from Basel in the 70’s. 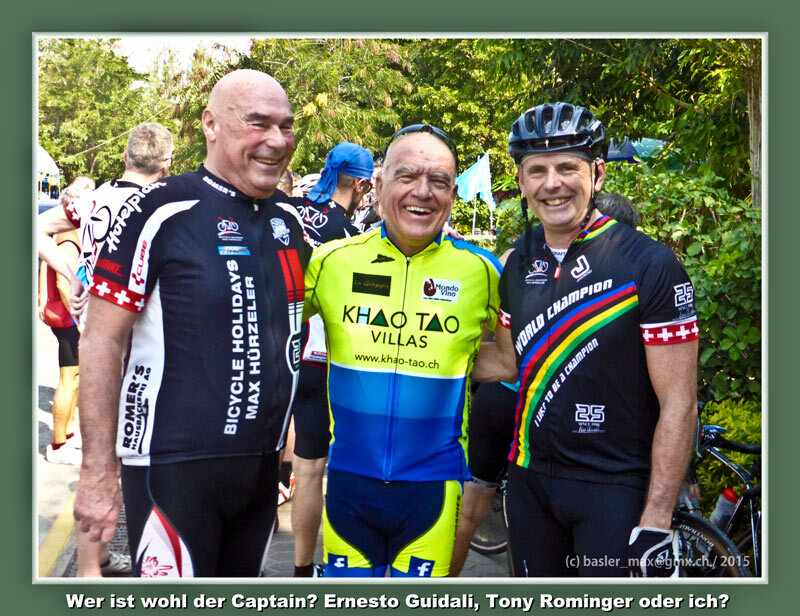 In recent years, the Hürzeler tour group started on their bike ride to the south with the flagship Tony Rominger in Hua-Hin. 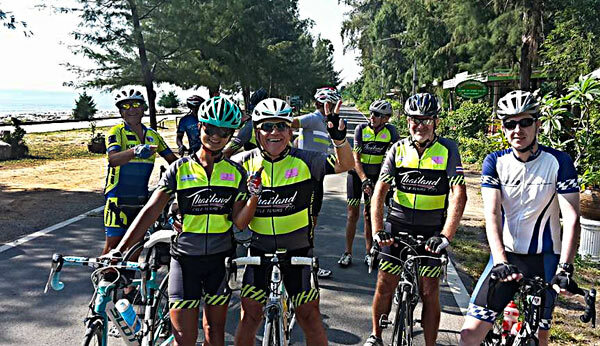 With Tony Rominger the multiple Vuelta and Giro winner, hour-world record man, we had the opportunity to make several joint rides in the area Hua Hin and get to know him as a great sportsman. An unforgettable experience. Only few have realized that the tour organizer Max Hürzeler was world champion of professional stayer in 1987 and rightly may be called "King of Mallorca". He created this bicycle paradise and made it famous around the world. Finally in march 2017 and 2018 we could welcome the winner of the 2010 Tour de France, Andy Schleck to unforgettable training weeks. Come to Hua Hin and visit us!